Global Voice Chat system instructions. 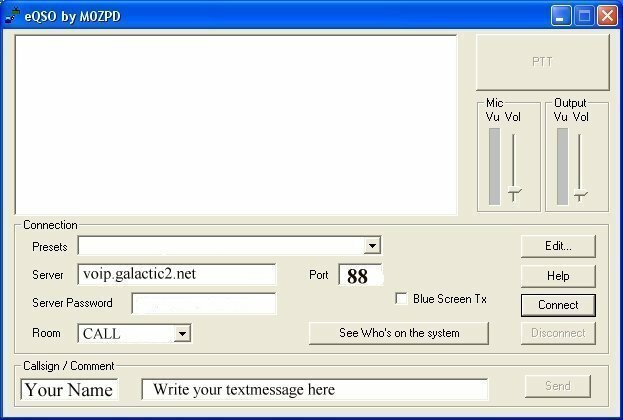 With this system you can talk to other people on the internet and to spacepeople (extraterrestrials). 2. Start the program when you are connected to the internet. 3. Fill in the parameters as this picture shows. First set the server port number. Then set the call sign. Here you write your name or nickname. Write CALL in the room field. Then press Connect. Press PTT or spacebar to talk and release it to listen. The name of the person who is talking into the system becomes blue. Only one person can talk at the time. You can write text messages in the text field and press Send to send it to other users. You can choose another topic by pressing the arrow right to the room field. You can also choose other topics. The call room is mainly for calling and talking to spacepeople. For non spacepeople contacts use another room for example CHANNEL 1 to CHANNEL 5 who also are open for all topics. You can temporary create another chat room by typing the name of it into the room field. This room will disappear when its empty. You can also connect by Walkie Talkie. If you do that you will connect to the system in the CALL room. You can buy a Walkie Talkie here.